Defender Louis Carey has insisted he is not focused on surpassing Bristol City's all-time appearance record. The 36-year-old is three games short of equalling forward John Atyeo's tally of 645 matches for the Robins. Carey signed a new one-year deal this week but told BBC Radio Bristol: "We didn't want people to think I was re-signing just to get the record. "At the moment I'm focused on pre-season and keeping myself fit. If the appearances come, then happy days." Forward John Atyeo played for Bristol City between 1951 and 1966 and was capped six times by England. He was never booked or sent off, and his 351 goals in 645 appearances for City still stands today as the club's record goalscorer and appearance holder. He passed away in 1993, aged 61, and a year later the Park End at Ashton Gate was renamed the Atyeo Stand in his honour. Capped six times by England, Atyeo played for Bristol City between 1951 and 1966 and holds both the appearance and goal-scoring record at Ashton Gate. 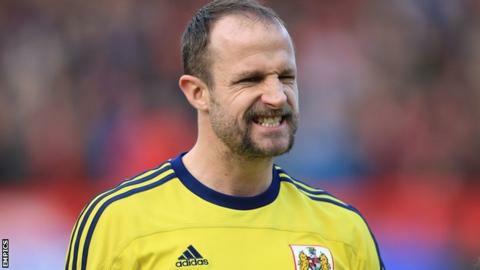 Bar a six-month spell at Coventry in 2004, Bristol-born Carey has spent his entire 18-year career at his hometown club. He played 17 games for City last season, in which they were relegated to League One. His previous deal was set to expire in the summer but head coach Sean O'Driscoll opted to keep him on for the 2013-14 campaign. "Louis's deal was important," said O'Driscoll. "I fought to keep him because of the influence he can have on the players, even when he doesn't play. "He's got a great fondness of the club and wants to see it improve." And club captain Carey believes he is in a position to help the younger players in O'Driscoll's overhauled squad. "If I can be here and playing, then happy days. If not, then I'll do what I can off the pitch," said Carey. "I know my age and the amount of games that are involved this year, and what we are trying to do at the club is bring young lads through. "When you've got a lot of young lads at the club at one time, and there's a big responsibility to get promoted, then there can be a lot of pressure. "You need to have someone around who can calm them down, lift them up, keep them buzzing. Hopefully I can do that. "The gaffer's got enough to do, he doesn't want to be doing that. It helps me and it helps him, so I'm happy. "Hopefully they can learn from me and I can help them along the way."